A dedicated employee at a specialist poultry business in Middleton-on-the-Wolds is celebrating 30 years of service. Jenny Penny began her career at Soanes Poultry in 1988 when she joined the team in the factory, before rising through the ranks to Quality Control Inspector, a position that she held since 2017. Although Soanes Poultry is still owned by the third generation of the Soanes family, the business is now under the general management of Nigel Upson who was appointed in 2012. When she’s not busy ensuring that Soanes exacting quality control standards are maintained, Jenny enjoys spending time with family and friends. 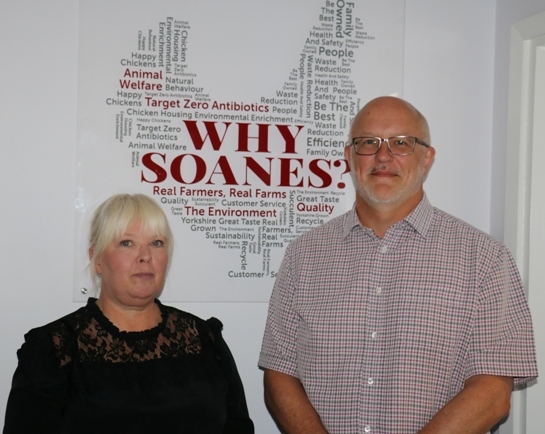 Soanes Poultry rears more than five million chickens per annum on its Yorkshire Wolds farms and supplies wholesalers, butchers, farm shops and independent retailers throughout the UK. It has won numerous awards for the taste of its chicken and its business credentials.